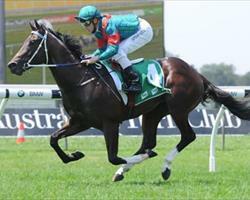 Office Bearer has been retired to stand at Murrulla Stud in the Upper Hunter Valley. The Phillip Esplin homebred won 5 sprints in Sydney and Melbourne topped by the LR Thoroughbred Club Cup (1200m) at Sandown Hillside. He bowed out with an unplaced run in the LR Ramornie Hcp earlier this month. Office Bearer (Officer – Street’em Sheila by Street Cry) was conceived in North America and foaled in Australia. He is one of 34 stakes-winners worldwide for G1 Belmont Champagne Stakes winner Officer. Representing the Relaunch sireline, Officer stood at Gainesway Farm and Taylor Made Farm before transferring to South Korea in 2010. His dam Street’em Sheila is a daughter of Australian bred mare Super Sheila (Last Tycoon) who claimed the G1 Turffontein Star Sprint in South Africa. He’s the only stallion at stud in Australia from a daughter of Street Cry. Murrulla Stud’s Tim and Celie Nolan will stand Office Bearer for a $2,200 (inc gst) service fee. Top stallion and the newest Gr 1 winning broodmare sire, Charge Forward, will return to the hands of his breeders after his sale to the Esplin family who will stand the stallion in conjunction with Murrulla Stud. The late Phillip Esplin and his family have produced some outstanding racehorses over the years including successful sires such as Reset, Charge Forward and Fast 'n' Famous, with their stakes-winning homebred sprinter Office Bearer being given the opportunity to emulate their success at Murrulla Stud. Announced last week as a new addition to stand at Murrulla Stud, stakes-winning sprinter Office Bearer has been given a good opportunity in his new stud career with the Esplin family committing the dam of Sunday's Australian bred South African stakes-winner Macduff to visit the young sire this spring. AFTER years in the wilderness, the one-time powerhouse nursery of Toowoomba is back in the main game and in-form trainer Michael Nolan has tipped the trend to continue. Synonymous as a sale with value for trainers and syndicators alike, the Inglis Classic Yearling Sale added its latest Group 1 winner to the mantelpiece, when three-year-old colt Brazen Beau claimed the Group 1 Coolmore Stud Stakes over 1200m in emphatic fashion at Flemington on Saturday.